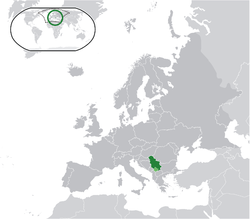 ^ The World Factbook: Serbia. 中情局. 2014-06-20 [2014-12-18]. ^ Official population projection for Serbia (2016). Republic of Serbia Statistical Bureau. [2016-01-07]. （原始内容存档于2016年2月2日）. ^ 4.0 4.1 4.2 4.3 Serbia. World Economic Outlook Database. International Monetary Fund (IMF). 2016-04 [2016-06-10]. ^ Country Comparison :: Distribution of Family Income – Gini Index. cia.gov. Central Intelligence Agency. [2014-08-30]. ^ Rift Emerges at the United Nations Over Kosovo. New York Sun. 2008-02-19. ^ V. Mijatović – B. Hadžić. I Kinezi napuštaju Srbiju. Novosti.rs. ^ Ronelle Alexander. Bosnian, Croatian, Serbian, a Grammar: With Sociolinguistic Commentary. Univ of Wisconsin Press. 2006-08-15: 1–2. ISBN 978-0-299-21193-6. ^ Application of the Charter in Serbia (PDF). European Charter for Regional or Minority Languages. 2013-06-11.